Discover the areas that best match your company’s needs. Then spend a little time exploring. L.A. County and its 88 cities represent a dynamic, multicultural economy with a diverse workforce and top universities and colleges throughout. L.A. County is the entertainment, manufacturing, and international trade capital of the U.S. and has a fast growing high-tech and digital media industry cluster. With more than $700 billion in annual output, Los Angeles County ranks among the world’s largest economies. Its GDP is larger than Sweden, Norway, Poland or Belgium. The County’s population of nearly 10.2 million would make it the 9th largest state in the U.S. Learn about each region’s incubators, accelerators, venture capital, and other support systems for startup companies, here. There are 88 business-friendly cities and 100+ unincorporated communities in Los Angeles County, each with a significant value-proposition in terms of workforce, land, infrastructure, incentives, and location. Cities within the county pride themselves on conducting business-friendly practices, with over one-third of the cities being either a finalist or a winner of the LAEDC Most Business-Friendly City award. LAEDC’s Business Assistance team offers expert, confidential consulting at no charge to help businesses determine which locations serve their needs. LAEDC is the region’s leader for commercial site selection services. Learn more here. Visit LAEDC affiliate World Trade Center Los Angeles for extensive details on each city. Gain more specific information about where certain types of businesses are clustering, where workforce and demographics suit your needs, and find available commercial and industrial sites by visiting the County of Los Angeles website, http://www.locatelacounty.com. 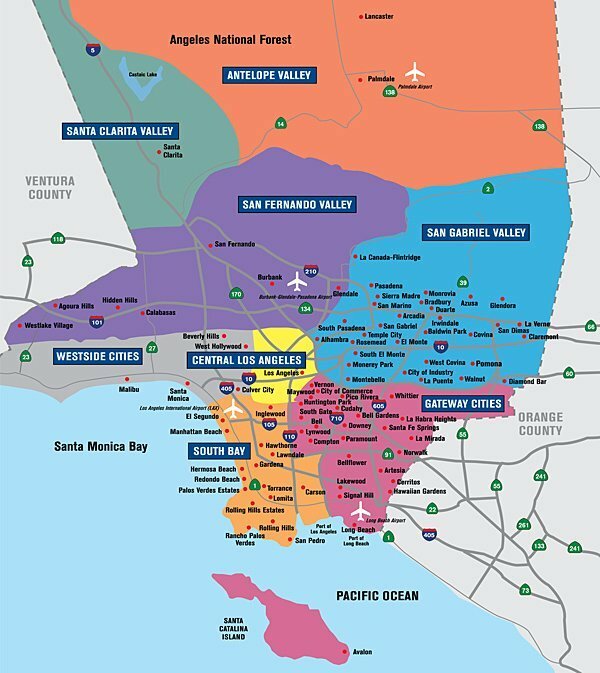 LAEDC’s Business Assistance staff can help you select a region to locate your business.